The Japanese Card of the Day for June 14th, 2018, is a Spike Brothers Double Rare from V-Extra Booster 01: The Destructive Roar, Unite Attacker. 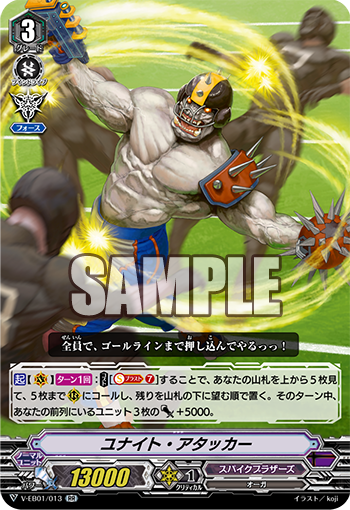 ACT [Vanguard Circle] Once per turn: [Soulblast 7] Look at 5 cards from the top of your deck, call up to 5 cards from among them to Rearguard Circle, and place the rest on the bottom of your deck in any order. Until end of turn, 3 of your units in the front row get Power +5000. Unite Attacker is a remake of a megablast unit from BT02: Onslaught of Dragon Souls, but is infinitely more playable than his 2011 counterpart. This incarnation of Unite preserves the call-5 theme of the original while making use of the heavy soul buildup from Wonder Boy, Highspeed Brakki, and Juggernaut Maximum. Note that you don't have to use Unite's call effect, since it says "up to 5;" you can simply soulblast 7 to put the top 5 cards of your deck on the bottom and give 5k to your front row. Under ideal circumstances you'll have a field of Juggernaut Maximums boosted by Wonder Boys for a total 41000 power (functionally equivalent to 38k) after Unite's power boost. That's before Force Gifts are factored in. Variance being what it is, most games will see different combinations of which attackers you're using between Maximum, Brakki, White Tight and so forth. But the core idea is the same; where the other clans center their big endgame plays in single cards like Soul Saver Dragon or Dragonic Waterfall, Spike Brothers spreads out its power gains across the rearguards and vanguard so that your strategy isn't totally bricked when you have one and not the other. With the clan already having access to redundant units like Funky Bazooka that can fill in for other cards, you shouldn't need to worry about getting Unite off consistently. The card also gives an out against retire matchups, as it can create a field from nothing--though you have no guarantees on quality there. Note that while Unite Attacker is a megablast remake, unlike Vortex Dragon he still has an Imaginary Gift. The previous Japanese Card of the Day was Attempt Mammoth.